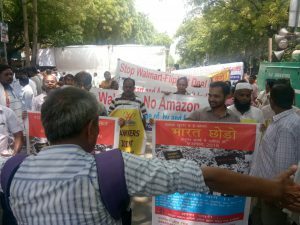 The newly formed Joint Action committee Against Foreign Retail and E-commerce, which include almost all major traders, workers and farmers associations of India, condemned the green light given to Walmart’s takeover of Flipkart by Competition Commission of India. It held protests in a few places in Delhi including at Jantar Mantar, and a few other cities in India. A action program for sustained protests against the acquisition were also announced. Press release with quotation from leaders of major traders, workers and farmers organisations is enclosed.